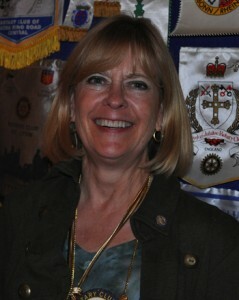 For the meeting of September 4th, President Peggy opened proceedings of the finest club in District 5130! Now, does she mean fine, as in, super good-looking? Or fine, as in, refined? Or fine, as in, we fine our members the most? Next, the president of the Rotary Club of Santa Rosa called on today’s extremely overworked Jackie McMillan to lead us in the Pledge of Allegiance. We were all in luck on this Wednesday…Jackie knew the words! Then Rotarian of the Month Kris Anderson gave what may not have been the finest invocation but it certainly was one of the shortest! There were only a handful of guests today, but Penny Tibbett’s son, Jack, was the center of attention when she introduced him. Another fellow Rotarian with her hands full today, Ann Gospe, introduced the delightful Marcy Smothers, today’s guest speaker; then she introduced Joan Kazmar, the guest of a rather-familiar-looking fellow by the name of Jeff Gospe. 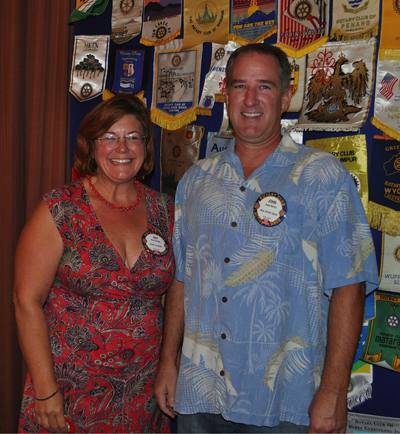 Past President Don McMillan welcomed back his returning guest and proposed member Eunice Valentine. Penny Tibbetts mentioned that one of our Rotary Club’s most senior members (since 1956) was recovering nicely from what she politely referred to as “non-complicated surgery”. The venerable past president (1967-68), Chuck Bartley, was remembered with a room full of deep sighs of relief. 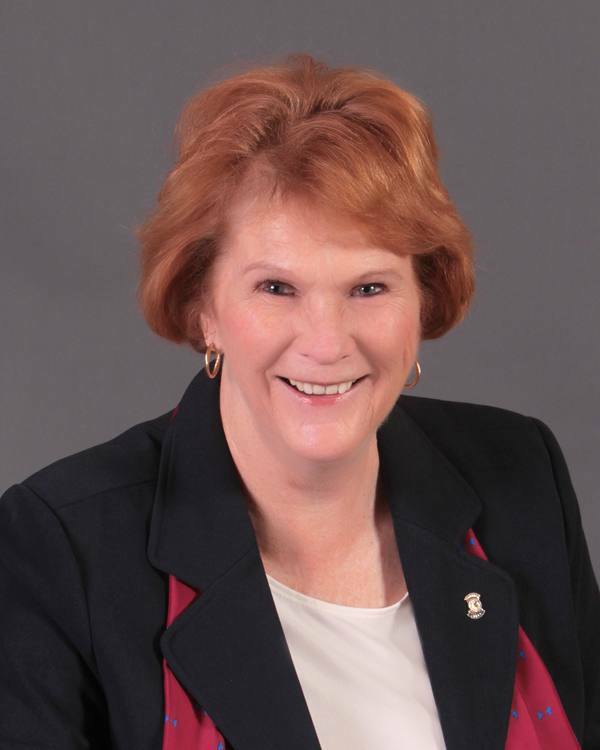 August’s Rotarian is an all-around hard worker—One of the bulletin editors, one of our club’s photographers, and co-chair of the Red Badge committee. She has helped at the Petaluma Bike Ride fundraiser and of course, at our own Giro Bello. She is a woman for all seasons. You all know who she is, our own Kris Anderson. Penny Tibbetts held a brief auction for two tickets to ride on the old Liberty Ship, Jeremiah O’Brien, during the America’s Cup race next Thursday on San Francisco Bay. Bidding was sluggish but the reliable Eileen Carlisle saved the day and, for $75 each, purchased the great opportunity to sail the Bay on the historic old “O’Brien”. Thanks to Penny for her donation and to Eileen. Carolyn Ivancovich and Ray Dorfman – lots of raffle enthusiasm! We know it wasn’t Red Badge Rotarian Carolyn Ivancovich’s fault, but when the lucky ticket was drawn by the lovely Cathy Vicini, she asked “Lucky” Ray Dorfman to draw for her & we had to endure what seemed like hours of mugging and prancing while Ray drew another loser—a Jack of something or the other. No one noticed if Ray pocketed the $10 consolation prize, if he & Cathy split it $5 & $5, or if Cathy still owns it all, but they left hundreds of dollars up for grabs next week at 3 to 1 odds. Don’t miss the excitement on September 11th. Take a chance and build a truly winning jackpot for next week’s lucky player. Congratulations to Anne Gospe and John Berto! Two of the club’s infamous Red Badgers lost their standing by meeting the requirements to receive their coveted Blue Badges: Ann Gospe and John Berto paid $10 each to the Sergeant-at-Arms Jack Geary, and the deed was done. 1.Better & broader communications both internally to club members and externally to the larger community. This includes promotion of our community service projects within the larger community and transparency within our Rotary Club. (a) Board minutes and monthly financial summaries accessible on our website under the member protection section. 2. Use the Heartfelt/Legacy Project criteria to create a long-term perspective that addresses community needs, is sustainable, and gives high profile to this Rotary Club. In other words, make an overall plan based on this criteria and apply to what we are now doing and what we want to do in the future. 3. As a result of creating the Legacy criteria, determine what programs, projects, and services meet these standards. What programs meet the needs of our community, and carry out our mission to service and give recognition to Rotary? Evaluate our projects. 4. Allow for engaging our families in Rotary. Structure some socials and some service projects that would allow for our families to join us whenever feasible. Happy Birthday greetings to Carl Campbell, Kerrie Chambers, Doug Chase, Genie Delles, Cecil Humes, Jackie McMillan, Ryan Thomas, & Penny Tibbetts. Have you noticed that more and more of us are turning out for the birthday recognitions? Thanks to Manuela Gonzalez’s efforts, the birthday gifts get more attractive and desirable every month. 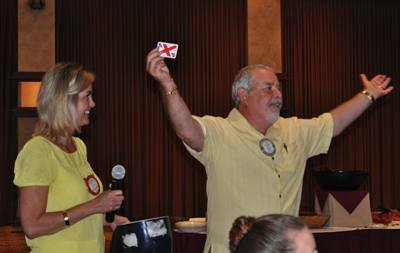 If you still have not made your Rotary commitment to sign up for at least two committees for the current 2013-14 Rotary Year, you may still sign up on the committee’s lists on a back table. Sunday Social at Cathy Vicini’s: A family barbeque for you and your family. The next Rotary Social is scheduled for Sunday, September 22nd. This is a family social, so plan on bringing the kids and grandkids. Doug Johnson and Carmen Sinigiani called for volunteers from our club to work the Monte Rio Rest Stop for the Grand Fondo Bike Ride on Saturday, October 5th. Volunteers are usually needed only from 6 am to 12 noon. When we volunteer we have lots of fun working together as a team, making peanut butter & jelly sandwiches, cutting fruit, and playing host to all the grateful Grand Fondo riders. 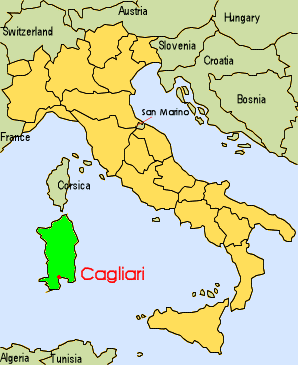 In exchange, the Santa Rosa Cycling Club helps us out for the Giro Bello, for free. No charge, nada, nothing but you volunteering to help others!! Christmas Poinsettias: Like Christmas, the Poinsettia Project is coming and Dan Walker would like our club’s Red Badgers to help him out with the annual Christmas Poinsettia sale in late November & early December. Your job, should you agree to accept it, is easy and fun: You take flower orders from Rotarians and supporters, and then you order the flowers. When they arrive, bring the poinsettias to the club on the day selected and help take them to the Vigil Lights Apartments down the street behind the Flamingo. Oh, here’s the best part: You serve up some cookies to the seniors who live at Vigil Lights and sing some Christmas Carols topped with Christmas Cheer. President Peggy called attention to this week’s photograph in the local newspaper picturing several Rotarians at an open house to discuss the donation of the old Warrack Hospital building to Social Advocates for Youth by Sutter Health. Club treasurer Cecil Humes and Rotarian Ted Wilmsen briefly discussed the number of young people aged-out of the foster kids system and announced that a tour, open to the general public, will be conducted to illustrate the advantages of the location, planned improvements, and other specific details. Cecil contributed $25 and Ted donated $50 to the club. President-elect Mark Burchill and his spouse Mary Lou Konrad have returned from their extended travels and were fully prepared to face the music—and the costs of recognition—for their travels to this year’s Rotary International Convention in Portugal, and visits to a total of nine European countries, including the cities of Amsterdam, St. Petersburg, Copenhagen, and others that remained unnamed. In return for his contributions of $25 to the Rotary Club and $50 to the local foundation, Mark shared his observations on the still obvious differences between freedom and communism in St. Petersburg, and put in a free plug for the Rotarian Home Exchange program in which they participate frequently. 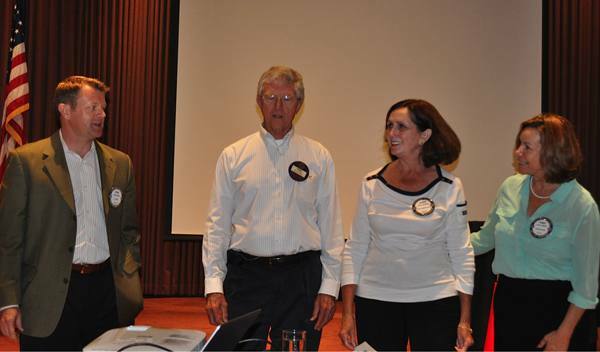 Past-president Bill Rousseau’s name was prominently featured on the president’s recognition list, but Bill’s Rotary attendance has almost been as scarce as Mark Burchill’s attendance lately. Rousseau’s tab continues to build and his return is highly anticipated by our current president. More thanks to Jackie McMillan for arranging Marcy Smothers’ appearance Wednesday as our special guest in recognition of her 10th year as a radio talk show host and home town celebrity. It didn’t take long for us to realize why Marcy has achieved such great success, even though she credited Guy Fieri for giving her that much-needed boost. Her charming sense of humor and a quick perception of what most of us are interested in are obvious. As are the contents of her unique first book called “Snacks: Adventures in Food, Aisle by Aisle”. It was difficult to decide which of the hundreds of all that she talked about was the most interesting, the funniest, or the most useful for any Sonoma County Chef, amateur or professional. Marcy even made the overwhelming hard work of writing her book seem like fun. 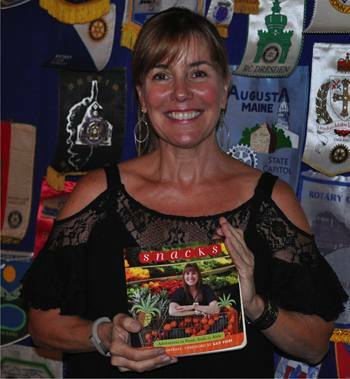 Here’s a last minute update: Marcy Smothers has signed four more copies of her book SNACKS exclusively for our Rotary members. They are on a shelf by checkout. Ask for the Rotary Book Club as this is the only way they can offer the 10 percent discounts. Here are the volunteers who contributed their help at this week’s Rotary meeting: Carolyn Ivanocovich, Joel Desilva, Manuela Gonzalez, Darren Elliott, Brandon Uhrich, and Matt Everson.